Si-Si aligning:The first wafer is loaded and a picture is taken of the alignment marks. 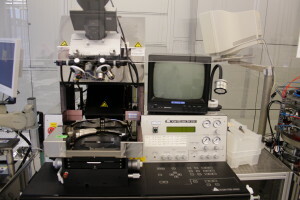 The next wafer is loaded and a camera system aligns the wafer to the picture. The two wafers are clamped in a fixture with a capton spacer as separation.Si-glass aligning:The same principle as Si-Si, but the aligning is done directly by seeing through the glass.Hence, the alignment marks must be placed one at the inside and one at the outside of the final laminate. Combined mask aligner and bond alignerThe window for the bond align camera is between 11.5 and 51.5 mm left and right from the centre, and within 10mm from the centre line in the y-direction. The alignment marks should be placed well inside this region to allow for some uncertainty in the loading of wafers on the slide.Alignment accuracy depends on bond aligner and bonder in combination. It’s generally hard to get better than +/-10µm at each side.